Rhonda D’Agostino cares for people with life-threatening complications due to cancer or its treatment – and helped pioneer a new ICU model that trains nurse practitioners and physician assistants to deliver the highest standard of care. 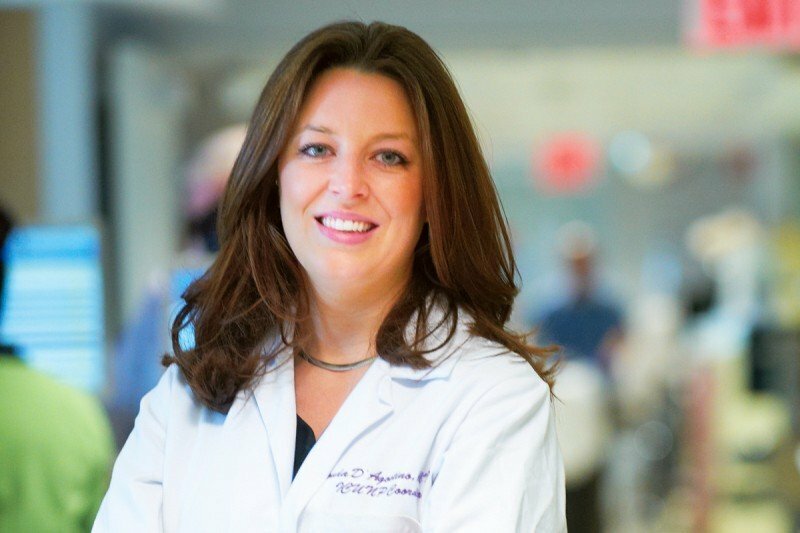 As nurse practitioner coordinator of Memorial Sloan Kettering’s intensive care unit (ICU), Rhonda D’Agostino takes care of patients who have developed life-threatening complications due to cancer or its treatment. She recently helped pioneer a program that trains nurse practitioners and physician assistants to deliver the highest standard of care in the ICU. I can vividly recall the day I decided to become a nurse. I was 15 and undergoing a surgical procedure. It was a scary experience for my family — especially when I had to be moved to the hospital’s intensive care unit to be monitored after the surgery. However, the nurse who was taking care of me had a magical way of making us feel safe and at ease. I was so inspired by her that I enrolled in a nursing program right after high school. By the age of 20, I was already practicing as a nurse at a small community hospital in Orange County, New York, where I had grown up. However, I soon felt a desire to branch out and to further my education. After earning my bachelor’s degree from Pace University, in Westchester County, I enrolled in a master’s program at the NYU College of Nursing to become a nurse practitioner (NP). Throughout my studies, I was working shifts in a number of New York City hospitals to gain hands-on experience in critical care medicine, a field I found to be particularly stimulating. For example, I worked in the emergency department of Jacobi Medical Center, which serves some of the city’s poorest neighborhoods and admits patients with the most-traumatic types of injury and serious disease. I witnessed a number of heartbreaking situations at Jacobi. Some of my patients had been in urgent need of treatment for months, but failed to come in earlier because they didn’t have health insurance. Nevertheless, I’m grateful to have had these experiences, which have made me who I am today — both professionally and personally. In 2004, I joined the Bronx-Lebanon Hospital Center, where I helped develop a graduate nurse training program. I loved working as an educator. However, when receiving my NP degree, I knew I wanted to have the opportunity to see patients as well. So when I learned that Memorial Sloan Kettering was hiring NPs for their new intensive care unit, I rushed to apply. I knew that this was my dream job. Every person on staff will do everything in his or her power to help whoever comes through our doors. When I joined the unit in 2007, I was amazed, because no other place where I had worked delivered such specialized and streamlined care. This has to do with the fact that most of our patients have life-threatening conditions and require vigilant attention around the clock. Many come in with sepsis, an inflammatory response to infection. Others have severe breathing complications. In addition, almost everyone in our care is undergoing intensive cancer treatment. Memorial Sloan Kettering has pioneered a new ICU model in which nurse practitioners and physician assistants (PAs) work in partnership with critical care physicians, coordinating every aspect of multidisciplinary care — from consulting with various medical specialties to organizing respiratory therapy and support services for patients and their caregivers. Together with physician Neil A. Halpern, Chief of the Critical Care Medicine Service, and NP Program Director Dennis Graham, I oversee the rigorous training, recruitment, and development of our NP and PA service. When this initiative started, in 2007, it was uncommon for NPs and PAs to practice critical care medicine. But the program we developed has been very successful, and has helped us address a growing demand for specialized and experienced staff while allowing us to provide our patients with more continuous and seamless care. Today, our unit employs close to 25 critical care NPs and PAs, who perform many of the functions that traditionally were provided exclusively by doctors and medical trainees. For example, we make rounds daily with attending physicians, perform invasive procedures, and interpret diagnostic tests. In addition, we manage Memorial Sloan Kettering’s rapid response team, which is called in when anyone in the hospital is in need of urgent care. My colleagues and I have published a number of articles about our program, and hospitals across the country are now incorporating our model into their ICUs. In my job, anticipation is key. My colleagues and I are rarely surprised when a patient’s condition suddenly worsens, and we take every measure and precaution possible. Many times, our preparedness is of great help to family members and other caregivers, who sometimes may have to make prompt decisions about their loved one’s treatment. One of the best ways we can support families is to communicate as openly and honestly as we can, while giving them all the support and privacy they need during what for many people is an exceptionally stressful period. One of the things that makes Memorial Sloan Kettering truly special is that every person on staff will do everything in his or her power to help whoever comes through our doors. We care for our patients as if we were caring for members of our own families. To me, this collective mindset is a never-ending source of motivation and hope, and the main reason I cannot imagine working anyplace else. My father has been in the ICU at MSKCC for 12 days now. I am blown away by every single staff member I have come in contact with. I have never seen a more dedicated team. Every one of you is kind, professional and compassionate. Truly Angels. Julie, we are so glad to hear that you’re happy with your father’s care. Best wishes to you and your family.